What looks like a giant glass pyramid is actually an envelope encapsulating four mixed-use towers. Parkview Green FangCaoDi is a LEED Platinum certified project setting impressive sustainability standards in Beijing. Similar to a bio-dome, Parkview Green makes use of a glass envelope to act as a buffer that helps reduce heating in the winter and protect the interior against the summer heat. Designed by Integrated Design Associates, and engineered by ARUP, this hotel, shopping and commercial hub is a massive project with a ton of other sustainable strategies. Parkview Green FangCaoDi is a 800,000 sq ft mixed-use development and is quite possibly one of the largest sustainable projects in the city. The collaborative design work of Integrated Design Associates and ARUP created a unique solution to minimize energy use. 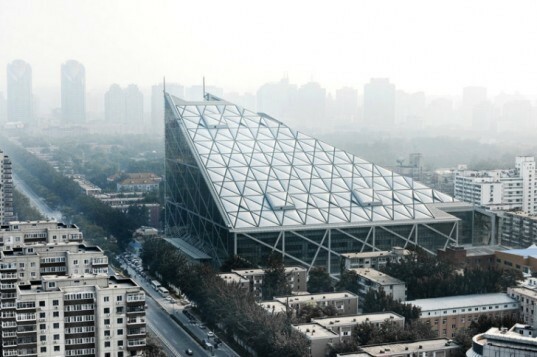 The large glass pyramid structure encases two nine-storey and two 18-storey towers housing a office space, a six-star hotel and retail facilities. The glass and ETFE envelope works to minimize heating and cooling in the winter and summer. Specially designed louvers at the top allow hot air to escape and natural ventilation and free cooling modes to be operated when outdoor condition is desirable. This buffer zone is a controlled microclimate in which the temperature and humidity is relatively uniform and easily changed. A geothermal system allows for energy-efficient heating and cooling when necessary. These hybrid passive and active mechanical systems save 60% on cooling costs in the summer and 80% on heating in the winter. The development collects rainwater from the roof and paved areas, which is then filtered and recycled for use as irrigation water. Waste water from sinks, showers and washing faucets is also treated for flushing and landscape irrigation. Materials were chosen based on their sustainability and the structure includes recycled materials from building demolitions for back-filling of the site and steel. Quickly growing softwoods were used instead of hardwoods, and native plants and trees were selected for their low water and low maintenance needs. What is the payback period for the cost of the enclosure from the savings in energy, but taking into account the offsetting costs of maintenance of the vegetation and filtering and treatment of different waters? Is it cost effective in China? Can it be cost effective in other global markets? I'm thinking I need to be an ARUP member, a company that would actually apply my many ideas on conservation. Parkview Green FangCaoDi is a 800,000 sq ft mixed-use development and is quite possibly one of the largest sustainable projects in the city. The collaborative design work of Integrated Design Associates and ARUP created a unique solution to minimize energy use. 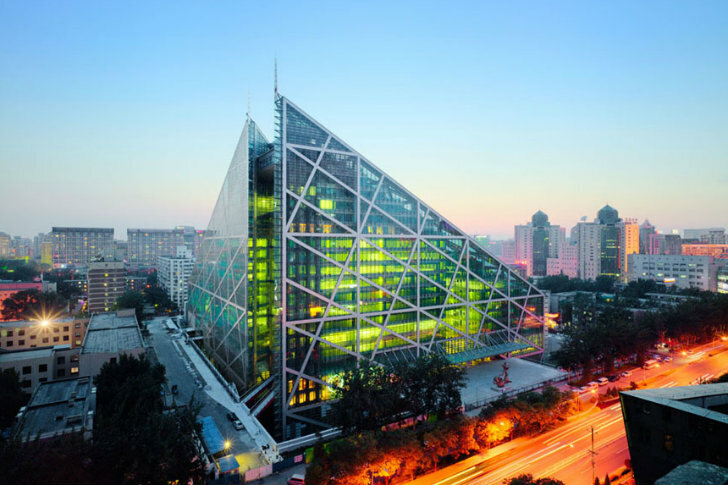 The large glass pyramid structure encases two nine-storey and two 18-storey towers housing a office space, a six-star hotel and retail facilities. The glass and ETFE envelope works to minimize heating and cooling in the winter and summer. Specially designed louvers at the top allow hot air to escape and natural ventilation and free cooling modes to be operated when outdoor condition is desirable. This buffer zone is a controlled microclimate in which the temperature and humidity is relatively uniform and easily changed. A geothermal system allows for energy efficient heating and cooling when it is necessary. These hybrid passive and active mechanical systems save 60% on cooling costs in the summer and 80% on heating in the winter. The development collects rainwater from the roof and paved areas, which is then filtered and recycled for use as irrigation water. Waste water from sinks, showers and washing faucets is also treated for flushing and landscape irrigation. Materials were chosen based on their sustainability and the structure includes recycled materials from building demolitions for back-filling of the site and steel. Quickly growing softwoods were used as opposed to hardwoods and native plants and trees were selected for their low water and low maintenance needs.